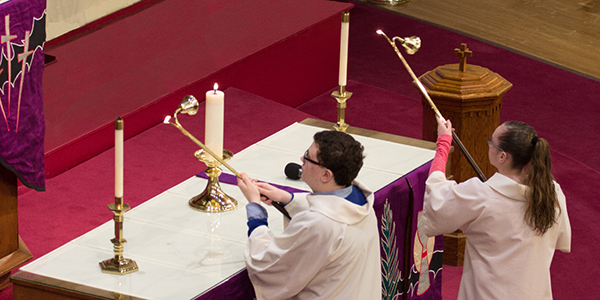 Acolytes participate in worship leadership during our 9:00 am traditional worship service in the sanctuary, symbolically bringing the light of Christ into worship by lighting candles. Children are trained in the meaning and responsibilities of an acolyte at the end of 3rd grade Sunday School and can sign up to be on the schedule after that. Contact the church office at 319-363-2058 or Martha Sears, acolyte coordinator, at 319-431-2215 for more information about acolytes. If schedule changes are required, please work with the other families to find a substitute or switch days. Please notify Martha Sears and the church office of the change. Bradon Y. & Jenna M.
Sinead A. & Alex B.
Isaac A. & Anna C.
Abby A. & Avarie K.
Johnny C. & Kyle L.
Elle C. & Harper K.
Janet N. & Chris H.
Rachel F. & Anna C.
John E. & Jenna M.
Sinead A. & Helen M.
Will E. & Avarie K.
Bethany Y. & Ellie C.
Isaac A. & Johnny C.
Alex B. & Anna C.
Chris H. & Harper K.
Helen M. & Janet N.